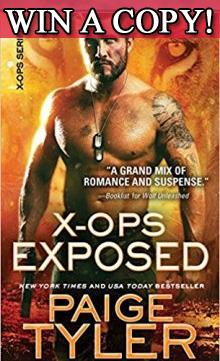 X-OPS Exposed is the 8th book in my X-OPS Series. Whether you’re a long-time reader of the series, or someone reading it for the first time, this is one of those stories you’re going to immediately fall in love with. It has it all—romance, lost love, second chances, action, danger, and adventure. What more could you ask for? Former Army Ranger-turned-hybrid shifter, Tanner Howland, and Russian doctor and scientist, Zarina Sokolov, have been circling each other since the very first book in the series, but just when it looks like they might get their shot with each other, everything goes bad. During a fight in the previous book in the series, Tanner lost control and caused a lot of damage. Terrified he might hurt those he cares about the most, Tanner ran off to a place where he’ll never put another person at risk, most especially Zarina. This a letter that Tanner could have left for Zarina to find after he disappeared. I’m sorry I had to leave without saying goodbye, but you know why I had to go. After what happened tonight at the DCO complex when I killed those bad guys, and almost killed the good guys, too, I couldn’t stay. The thought that it could happen again, that I could hurt you next time…I couldn’t let that happen. I don’t want to leave, but I’d rather die than even think about hurting you. You mean too much to me. You mean everything. I know you’re going to be mad. That you’d try and tell me you’re on the verge of a breakthrough. That you’re close to creating the antiserum. But I’m not getting better at controlling the beast, and you’re not going to be able to make an antiserum to help me. If the animal they put inside me was the only problem I had, then maybe it would work. But it’s not, and I need to stop putting other people at risk when I’m a lost cause. Please don’t try to follow me. You know this is for the best. It’s the way it was always going to end. I’m an animal…a monster. I deserve to be all alone in the forest, where I can’t hurt anyone. I’ll never forget you and everything you did for me. When I was at the worst point in my life, you rescued me and did everything you could to pull me back from the edge. I can’t tell you how much I wish you could have done it. Because the only thing that’s worse than walking away from you is the thought of hurting you. It’s the only thing that would ever make me leave you. Again…please don’t try and follow. You won’t find me.